Facebook's "Timeline" Coming to Facebook Pages. 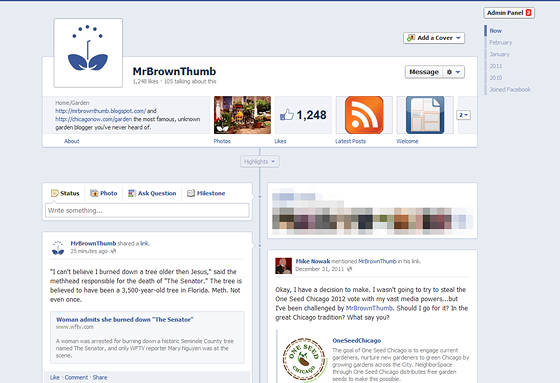 On March 30, 2012 Facebook's Pages will be redesigned to show the new Timeline style of profile pages. Ugh. What may look cool as a profile page just looks confusing as a Facebook Page. Here's a preview of what my garden blog's Facebook Page looks like using the new Timeline interface. Where exactly am I suppose to share links? The all-in-one status button works for profiles, I suppose, but isn't a good choice for a Page where you primarily share links to articles and posts. That header picture could be fun, but it gave me a fit. I started stressing about what I wanted to feature up there. I'll have to give it some time and think about it. Mark Zuckerberg doesn't seem to want us posting links, it seems like he's taking a page out of the myspace playbook, by making the place more and more link hostile. Remember when he hid the links posted to our profiles? What is needed is for people to demand that tabs be brought back, and for him to make profiles and pages and groups customizable... Where we have the choice of trying the new ideas FB rolls out and opting out of the ones that aren't helpful. When I read the FAQ on why automatic feeds of each blog post were eliminated, fb stated it was an "enhancement" -- you now have to go into your page, and write something in the status about the fact that you just posted on your blog. Fb wants to replace google or wordpress ... it intends to be the place where you write your blog post updates. Indeed, an enhancement --- for facebook! I hate the timeline, but I love that they added Messages to pages now. Hopefully we'll get used to our timelines soon. It needs to settle down. We post blog items automatically using the networkedblogs app, and now FB lumps everything together at the statr of the month rather than having seperate items.